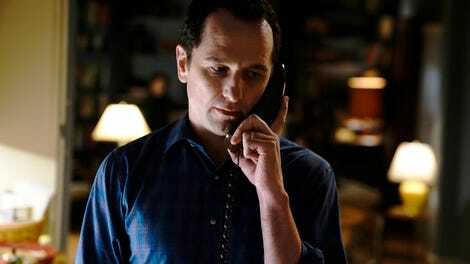 Three episodes of The Americans’ final season down, three deaths at the hands of Elizabeth Jennings. I’m no FBI agent, but I’m willing to say that a pattern is emerging. Her latest victim, Evan, is a hapless dupe who should’ve been at least a little suspicious of a security audit being conducted in a hotel room. But Tracy Huffs (best guess at the spelling of a fake name) is friendly, and she has what appear to be the proper credentials, so why not provide her a detailed layout of the storage facility where the lithium-based radiation detectors are housed? It’s old hat for Elizabeth, a game of make-believe in which the right props, look, and attitude can earn the confidence of a complete stranger. But when that stranger exposes his own vulnerabilities, a different workplace instinct kicks in. He shouldn’t have given her his girlfriend’s name. Evan turns his back and loses his life, a shocking turn for the final moments of “Urban Transport Planning” in spite of the fact that it’s repeating the way the preceding two episodes ended, albeit with less blood. In place of the gore, there’s a reminder of a) Elizabeth’s strength and determination, and b) the fact that any Leonard Cohen love ballad can double as a death waltz. Was Evan always marked for death, or did the reveal that he’s dating a woman in security, Teresa Vasquez (once again, best guess at the spelling), flip a switch in Elizabeth’s head? It’s left ambiguous, though there’s a hitch in Keri Russell’s voice and a close-up on her face that makes me lean toward the latter. That “she’s great” is the one time during this entire meeting that Elizabeth’s façade slips. Whatever the truth of the matter, the scene brings “Urban Transport Planning” full circle. It’s the type of Americans episode where the theme is particularly pronounced, but it generates so much good stuff between the characters that I hardly mind: The lack of secrets and barriers that once defined Elizabeth and Philip’s marriage is reflected in the relationships between Evan and Teresa, Stan and Renee, Sophia and Gennadi. Evan and Teresa work together; Renee raises the prospect of joining Stan at the FBI. Sophia and Gennadi are not co-workers on paper, but their work as informants has gotten tangled up in their marriage nonetheless, and the ultimate undoing of their wedded bliss involves the disclosure of the secrets they held together. The cold open, and a triptych of mid-episode scenes, choose the appropriate setting to explore such relationships: At the dinner table, over a cutting board, in front of a pile of dishes. The sight of so many past Jennings family blow-ups, the kitchen takes on a particular significance in “Urban Transport Planning”—after all, it is, as one HBO comedy recently described it, the modern hearth. The characters gather there to pass down traditions, to remember their other home, to make plans for the future. The way the scenes transition from the safe house to the Jennings’ to Stan and Renee’s is really something, a progression from preparation to consumption to clean-up, and at each stage the characters show tenderness to one another while also putting their complications and conflicts on display. Claudia sends Paige to get an ingredient they already have in order to pass Tracy’s bogus credentials to Elizabeth; Renee and Stan wade into testy waters, acknowledging that they occasionally tune one another out when they’re recounting their days. But there’s a tension that’s unmatched in the middle of these three scenes. Elizabeth brings home a Tupperware container of the zharkoye she was making with Claudia and Paige, leftovers from the informal cultural immersion being conducted for the eldest Jennings child. Matthew Rhys, who has a lot of mopey notes to play in “Urban Transport Planning,” exudes Philip’s Proustian reverie as he hovers over the container. It’s a kind gesture from Elizabeth, but it’s in vain, since Philip already ate and they can’t very well maintain their cover while storing Russian dishes in the refrigerator. So down the sink it goes. It’s one tiny piece of the place they left behind, but Philip’s too full of kung pao chicken and lo mein to enjoy it. “Urban Transport Planning” pokes at some of the deepest fissures that have formed between Philip and Elizabeth: His devotion to EST (which, as he relates to Paige, has changed its name to The Forum), her commitment to the Soviet cause, his embrace of the American dream, their differing opinions on the value of fear. Early in the episode, Sophia placates a worried Stan by telling him “We’re Soviets, we know how to keep secrets. It’s what we do,” and while Philip and Elizabeth are still good at keeping secrets, they haven’t really been Soviets for a long time. At this point in the Cold War, the forecast calls for a USSR that could become as Americanized as Philip’s takeout dinner; “Urban Transport Planning” tells of a Pizza Hut in Moscow and shows us a Russian diplomat eager to take in a baseball game. It’s great news to Philip Jennings, the co-owner of Dupont Circle Travel, who in his three years free of spy games, has bet it all on the American dream. Witness the speech he delivers to his employees, another excellent modulation from Rhys in which he whips The Saddest Man on TV into a pep-talking frenzy, encouraging his employees with pointers from Success Through A Positive Mental Attitude tinged with that old EST magic. Unfortunately, he’s placing financial bets on the American dream, too, coming up short on Henry’s private-school tuition following the travel agency’s expansion. There are more things eating away at Philip than Elizabeth’s mission, but she remains the cause of his longest stares into the middle distance. And since they know one another so well, secrets or no, she manages to jiu jitsu the “It’s morning again, in Moscow” speech he gives at the kitchen sink. Just as Philip is preserving some of the past in the travel-agency office, Elizabeth has found a little piece of the world as she wishes it was in the Little Russia of the safe house. She’s letting Philip in on a secret when she tells him how much she values her time there, and how much she hates walking back out into America circa 1987. There’s some excellent dialogue in the exchange—“I walk out of there and it just hits me in the face: here”—but it doesn’t get any better than this. The verbal sparring is an emotional gut punch, and helps “Urban Transport Planning” achieve a narrative goal: It shows that the Jennings are truly at odds with one another. As Philip dons the Brad Eckert getup again, walks the perimeter of where Elizabeth meets with Evan, and eventually rendezvouses with Oleg, there’s a feeling that he’s run out of options, that he can’t think his way positively through this one. He has to know what Elizabeth is up to—for his peace of mind, the future of family (somehow I’ve gotten this far without mentioning it, but: The sight of her mother spattered in brain matter is not one that’s sitting well with Paige), and possibly for her sake, too. He has no other option. Which has a twinge of mordant humor to it, because as Elizabeth’s up in that hotel room, she has no other option, either. She knows better than anyone: What little Evan has learned there, he’s going to share it with Teresa. And so she takes him out, escalating the stakes for season seven, and raising the possibility that someday, the person in that headlock won’t be a stranger, but someone she loves. The Americans Wig Report, Week Three: A-. It’s a study in contrast for Elizabeth this week: The light, friendly, pixieish look for Tracy versus the “Elvira is Joan Jett in The Exene Cervenka Story” job she does while eavesdropping on the negotiating team. 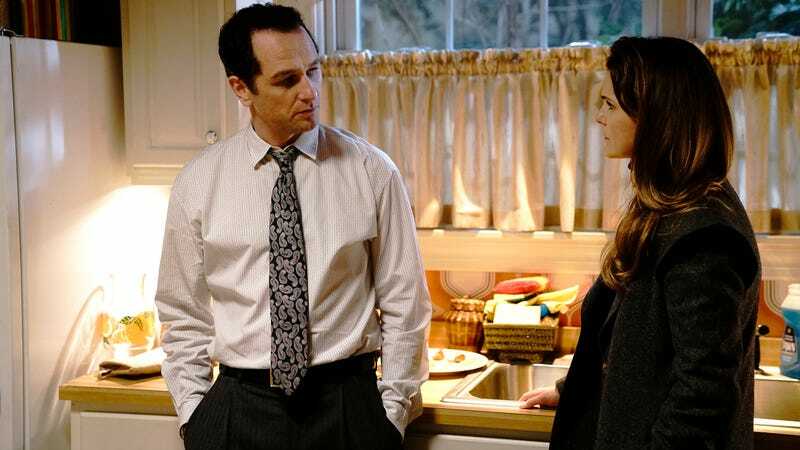 The Americans Soundtrack Report, Week Three: B. Elizabeth’s murder streak continues, but the show’s Talking Heads streak ends. As far as consolation prizes go, it’s tough to beat “Dance Me To The End Of Love,” a Leonard Cohen composition whose origin story is gloomy even by Leonard Cohen standards. Was there any Mail Robot? No, but someone—or some machine—had to bring Aderholt the photos that are splayed out in front of him in the vault. A theory: Elizabeth, shaken by the magnitude and potential consequences of her mission, is leaving a sloppy trail because she wants to get caught. Small talk about the ’87 American League East champion Detroit Tigers and a reference to the aforementioned Canada Cup in a single conversation? The Americans, you shouldn’t have.